Wool, meet wool. If there were ever a natural partnership, it’s this one. Our 2014 collaboration with UGG Australia was an immediate hit and a nearly immediate sell-through, so we’re excited to bring you another collaboration for this holiday season. 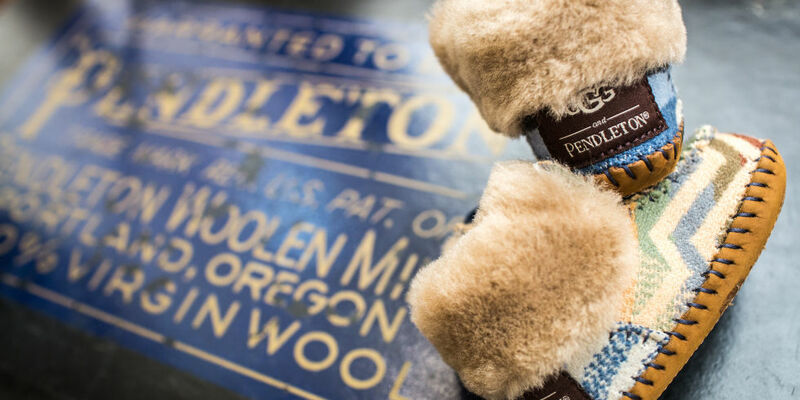 We talked about the shared heritage of UGG and Pendleton in a post last year, which you can read here: 2014 UGGs & PWM. 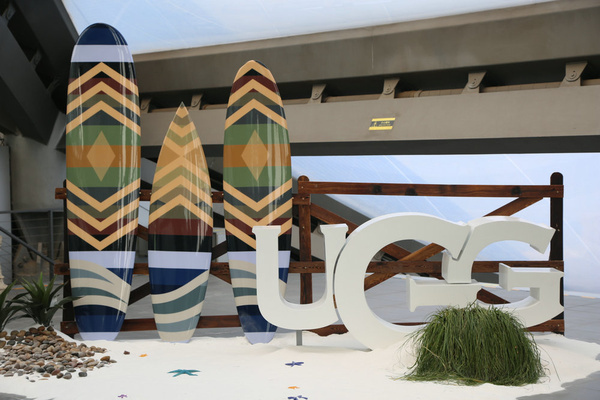 Both companies have roots in Southern California’s surf culture, a point nicely illustrated by this display at the UGG Australia HQ..
Our new pattern, exclusive to this collection, reflects this shared history. 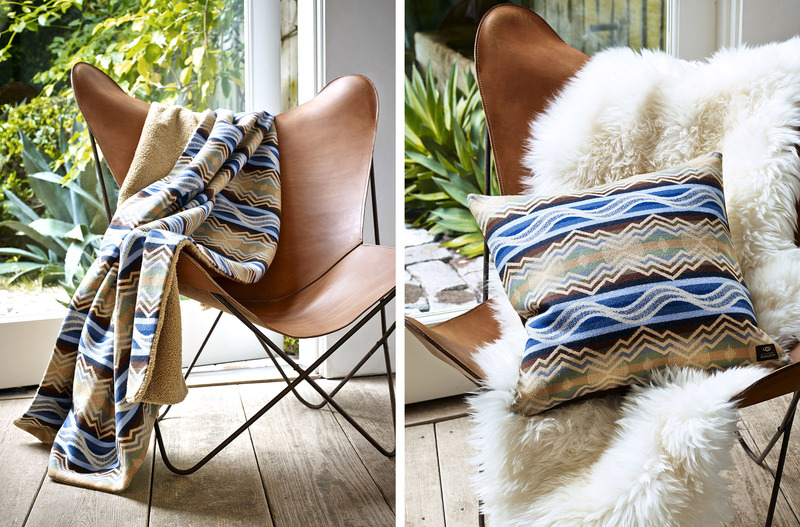 Inspired by the place where the mountains meet the sea, this banded design has mountain peaks and rolling waves in natural hues. 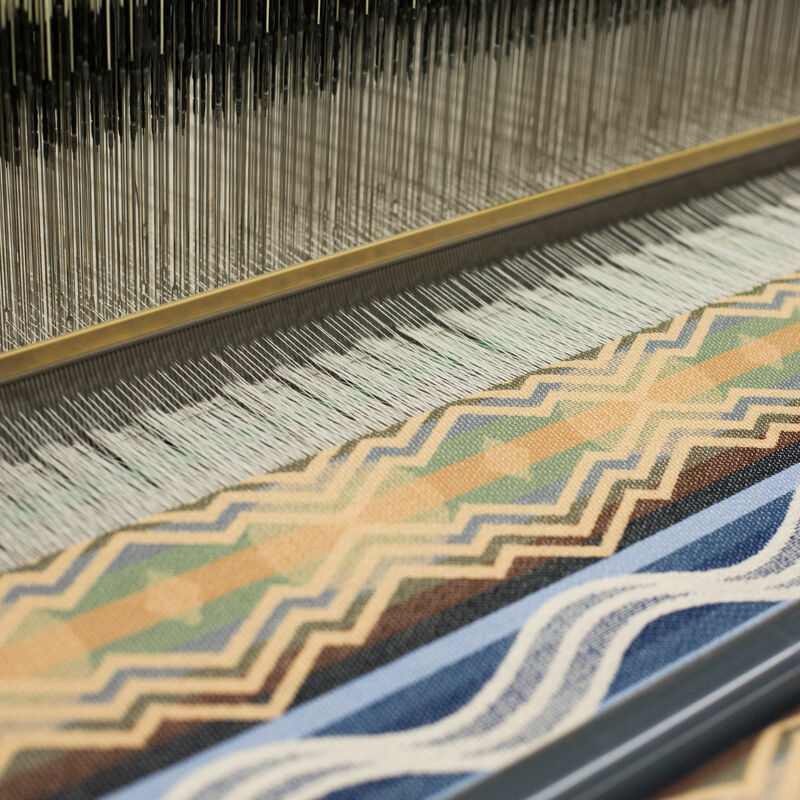 Here it is on the loom at our USA mill. There’s something for everyone; scuffs, mocs, lace-ups, slip-ons, and the classic UGG in short and tall. There’s an exciting lace-up Adirondack waterproof boot that’s going wild on Pinterest for us. There’s even a baby bootie. JUST LOOK AT IT!! 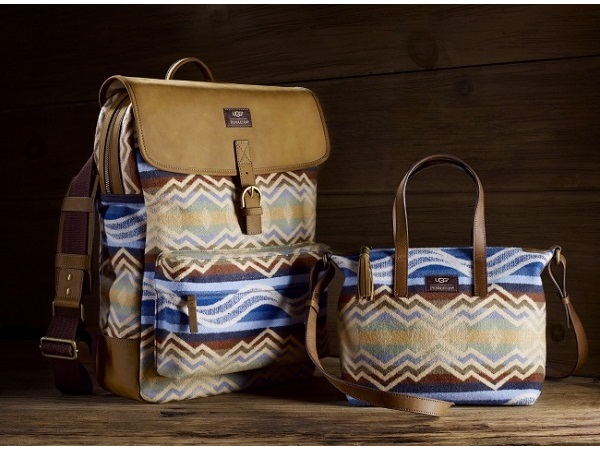 We’re rounding out the offering with vests for both men and women, and assortment of well-crafted bags. 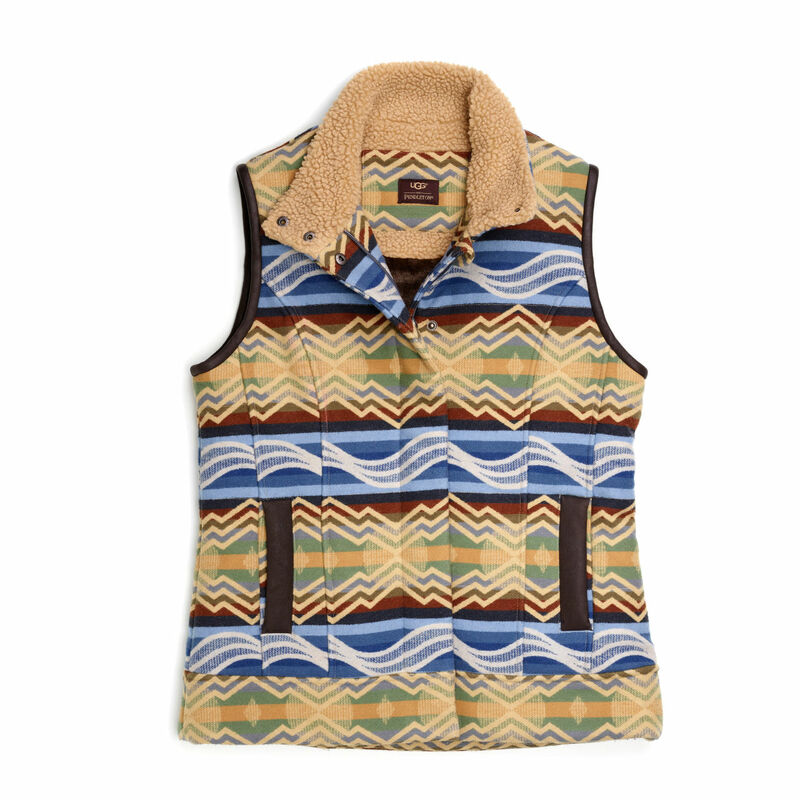 Most of the footwear and bags and both the vests are available at Pendleton.usa.com, including this beautifully constructed women’s vest. 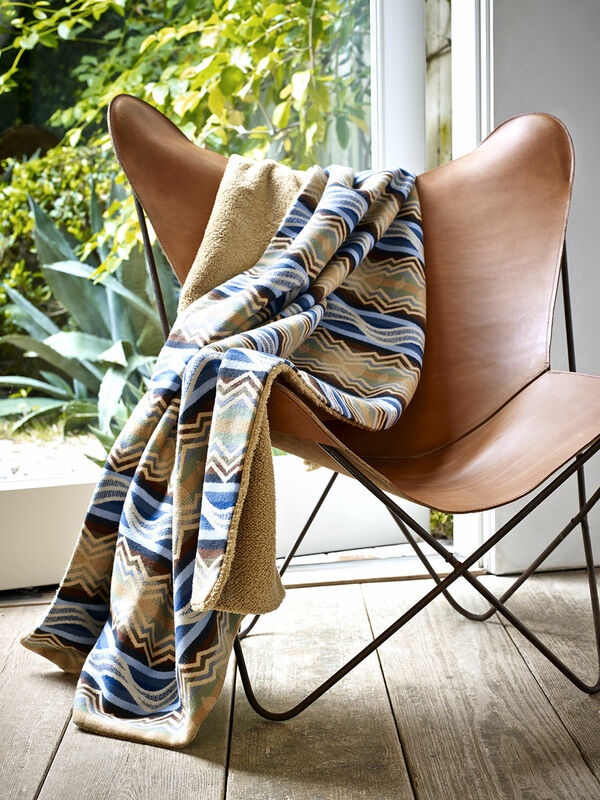 Exclusive to Uggaustralia.com are two pieces for the home; a fleece-backed throw and an oversized pillow. We have to show them to you, even though we aren’t carrying them; they are simply beautiful. We’re garnering some nice recognition in the press, with more to come. You can read about us in GQ and Town & Country. Last year’s collection went fast, so don’t wait to make your choice. You don’t want this one to run away from you! Follow the links in the post! I know I’m years behind n discovering the “Where the Mountains Meet the Sea” collection. I’ve found the boots new but am having the hardest time finding any matching items. Is there any change the outlet stores would have the tote or the vest? Is there a way to purchase the fabric? Thank you for taking the time to read this message and advising me on the best way to locate or create a coordinatingitems to go with the UGG/Pendleton boots. I love to match, and my Yosemite and Grand Canyon Uggs look amazing paired with the matching Pendleton scarfs and hats. Thank you! Sadly this collaboration is done for now, and we do not have any items left in our stores or outlets. We suggest you try eBay? We have new collabs with UGG in the works, just to let you know!